pimpification (pimpâ€™-if-fic-ka-shen) n. Customizing a standard turn of the century four story walk-up using large quantities of stucco, glass and chrome. The end product should be jarringly out of context and garish, if not downright bizarre. â€”pimpâ€™-i-fyâ€™ v. (ified, fying, -fies) Not to be confused with crapification. See: Green Street. First came the stucco and chrome. 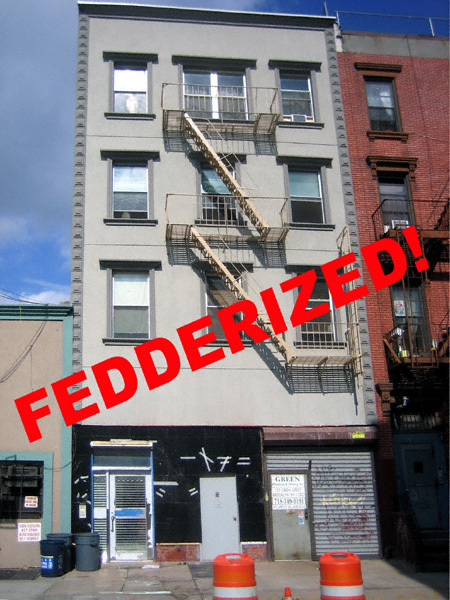 I called it Fedderized. Then they painted the curb yellow and wrote “No Parking 24/7”. My neighbor parked there anyway. She got a ticket. She called the city; they got a citation and were ordered to correct it. 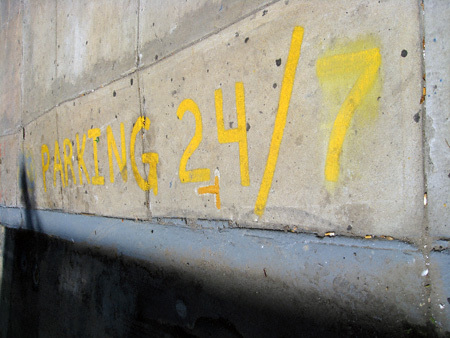 Now the sidewalk reads “Parking 24/7”. 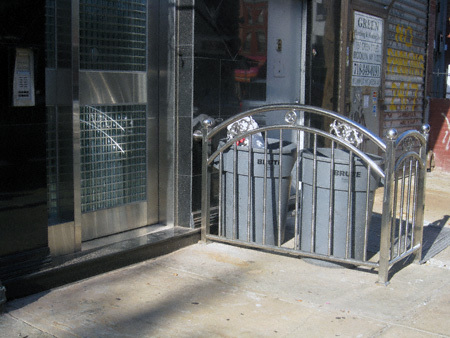 Then came the awning and garbage can holder. 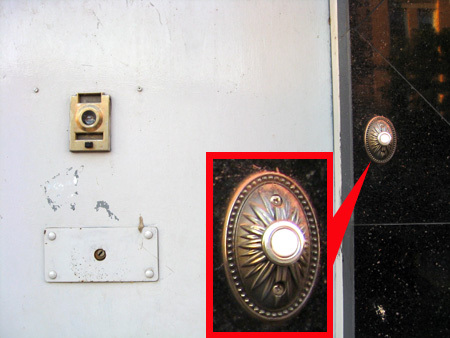 Finally the fancy doorbell next to an institutional grey sheet metal door caught my eye. Then it hit me: this was no mere act of crapification. This was something more. 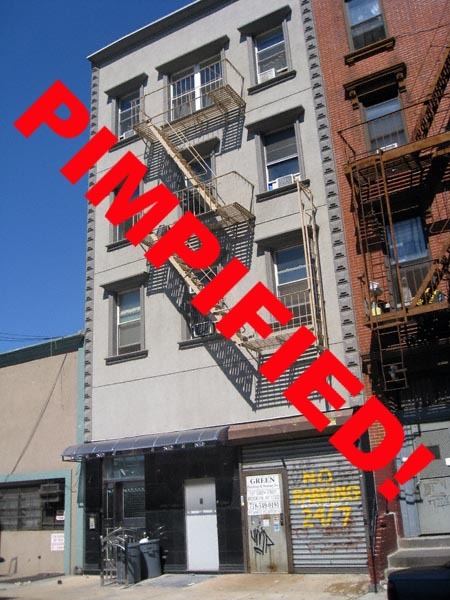 This building has been PIMPIFIED! oh my god, I love it!!! That’s hilarious (and garish!). 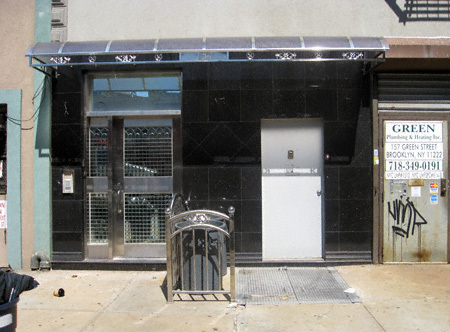 Back when I had a car, I wondered about those spray painted “No Parking” notices in front of construction sites. I mean, it’s not advisable to park in an area with nails, broken glass, construction debris, etc but sometimes parking is limited and you have to. However, I always wondered about the legitimacy of those signs and wondered whether you could actually be ticketed/towed. It sounds like this cop took the sign seriously – but was he just filling a ticket quota?